Since I’ve started working full time (and having the steady full-time paychecks that come along with it), I’ve noticed one BIG change in hubs’ and my mentality toward debt payments: We’re a lot more eager than we used to be. Now, don’t get me wrong. We’ve always been eager to get out of debt! But what I mean is that we aren’t taking as many precautions and have a little bit dangerously low safety net in place currently. Prior to landing the full-time job, we had extremely variable income. In hubs’ job, alone, he’s had months where he’s made nothing and months where he’s made nearly $10,000! That’s a huge fluctuation! While my income was always a little bit more stable (in terms of the same amount of money almost every month), it was an adjunct position so there was no stability in terms of long-term job security. I sign a semester-by-semester contract so I only ever have a guarantee for just a few months at a time. My full time job now fills that void. It offers safety and security. I know that, no matter what, I’ll be getting a paycheck every two weeks for $X amount (of course, this is assuming I fulfill my job duties…I’ve never heard of anyone being fired mid-semester but I presume it could happen if one were to just drop off the face of the Earth or something drastic happened). But you get my point. This steady money provides a bit of a safety net that, otherwise, we had to do ourselves through savings. So, although I don’t like how thin we’re running on money right now, we’ve been making some much riskier financial decisions than we have in the past. All of our savings accounts are dangerously low. Under a thousand in our emergency fund. Only a couple hundred in our car repair fund, a couple hundred in our health/dental/vision fund, a couple hundred in our annual expenses fund. All of our savings are grossly under-funded right now. Plus, we’re slipping into a limbo of living on last month’s income. Basically, I still use my full-time paycheck to live on last month’s income, but all of my part-time pay I’ve started using toward the current month to boost up our debt payment figures. Same thing with hubs. He had a no-income month in August and, since then, I’ve been using his pay for the current month simply out of necessity! It’s a slippery slope and I know that we’re sliding a little bit. I really want to pay off our car. Like….I really, REALLY want to pay it off. We have a super small safety net until the car is paid off. Then we bulk back up our savings and everything is fine. No big deal. We have a super small safety net and something happens that requires immediate money and attention (e.g., big car repair, unexpected health issue, etc.). We divert the money we WOULD have put toward car debt toward the new issue. The car isn’t paid off as quickly, but we all survive. Maybe I’m missing something, but this is how it seems to me. Even if (knock on wood) we suffered some unforeseen financial blow, we have the funds to deal with it…it would just require us to put less toward debt. So it would blow the goal of paying off the car by December, but we would still be able to weather the storm. To try to make sure this is the case, I’ve been putting off debt payments until late in the month when I know, for sure, exactly what hubs’ income is for the month, how much money we’ve got for the next month (from our now modified living on last month’s income fund), etc. It certainly feels risky at times, but my hope is that this is only for three months. 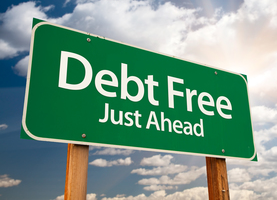 By the time the new year rolls around I hope and pray that we’ll be consumer debt-free (meaning, the car has been paid off). If that’s the case, then we may take January “off” of debt-payments (aside from minimum obligations) so we can re-stock some of these savings that really should be funded at a higher level. That’s the plan anyway. We’ll see what curves life throws our way. Have you ever lived with a super-low financial safety net for a period of time in order to try to meet some financial goals? If so, did it work for you? We’ve done this once before. Back when we paid off our Wells Fargo credit card (in May 2014), I made a a giant payment (like $3500) to pay off the card in full before I even knew if we had the money available. To clarify, that’s when we had a 100% variable income (no steady pay), so we literally had the money in a checking account but I didn’t know if we’d have enough money coming in to cover the rest of our bills for the month! I made a giant leap and just paid the bill in full and crossed my fingers that it would all work out. Thankfully, it did. We earned enough to cover the rest of our bills and all was fine. I’m hoping for a repeat situation now. I want this car loan debt gone NOW!